Family is a big part of our everyday lives, and is something you usually talk about when interacting with others. In Italy, families are close and a very important part of the culture. When you think of Italian culture, you think of massive tables full of pasta, with lots of people gathered around them, chatting and smiling while drinking wine, right? Therefore, if you’re learning Italian, it’s good to know how to talk about your family and in this post, I’ll show you how. Mio padre vive in Germania. / My dad lives in Germany. I miei genitori possiedono due case. / My parents own two houses. Mia sorella è bionda. / My sister is blonde. Mio fratello gioca a calcio. / My brother plays soccer. Mio figlio è in vacanza in Australia. / My son is on holiday in Australia. Mia figlia va molto d’accordo con sua zia. / My daughter gets along well with her aunt. Niece/Nephew = Nipote. The same term is used both for females and males and also indicates grandson and granddaughter. Mio nipote è il secondo figlio di mia sorella. / My nephew is my sister’s second son. Marco è il nipote preferito della nonna. / Marco is grandma’s favourite grandson. Mio cugino ha 3 anni meno di me. / My cousin is 3 years younger than me. Mia cugina ha molte bambole. / My cousin has lots of dolls. I miei nonni hanno due gatti. / My grandparents have two cats. Now that you know the main terms, it would be worth (and for sure fun!) to improve your skills by watching and reading family-related content. But where can you find good content? LingQ’s clean interface allows you to read and look up words with a simple tap. Also, lessons come with audio you can listen to so you can hear how the words are pronounced. 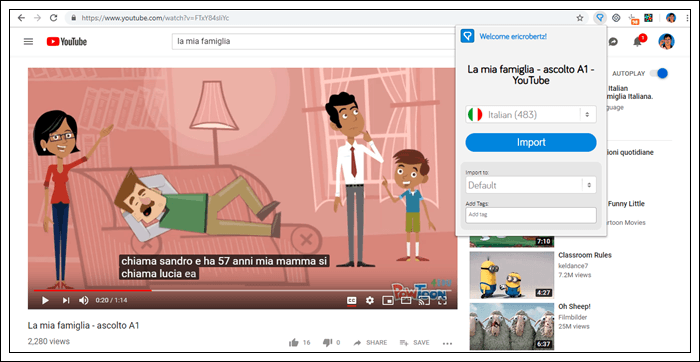 Not only can you choose from hundreds of Italian lessons from LingQ’s library, but you can also import your own content. Whether it’s Italian audiobooks, music, or blogs, LingQ can turn pretty much anything into an interactive lesson. Let me show you how to import Italian YouTube content into LingQ. For the sake of this post, it will be related to family and culture. Please note, in order to import content into LingQ, you need the LingQ import extension (circled in red). A simple google search will lead you to the right download (depending on your browser). Also, the video you want to import must have closed captions enabled. Then click the LingQ extension, hit import, and wait a few seconds. LingQ will take the content and turn it into an interactive lesson. What’s great about this is now you can look up the dialogue, save new vocabulary, and watch/listen to the video. You can take your lesson on the go using the mobile app too. There you have it. 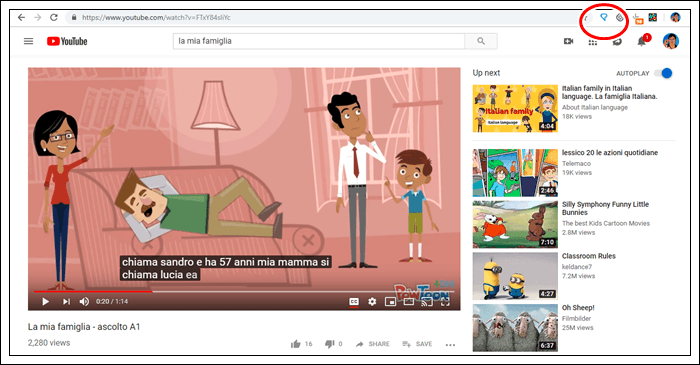 Using LingQ you can learn Italian from content you love. By reading and listening to native content on regular basis, you’ll start to notice improvement. It’s that simple. Give LingQ a try today and start learning.